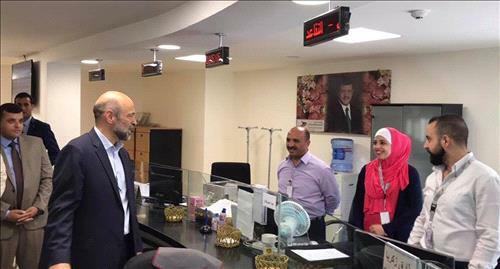 AMMONNEWS - Prime Minister Omar Al-Razzaz paid a surprise visit Tuesday to headquarters of the Social Security Corporation in Wadi Saqra to inspect the progress of work and the level of services provided to citizens. The Prime Minister said that each employee should work to raise the level of satisfaction for service recipients and provide services in a short period of time, stressing that the satisfaction of citizens is a top priority for the government. Al-Razzaz pointed out during his field tour, the need to provide available electronic services and keep pace with developments to improve these services. "The corporation was established to serve citizens, protect them and meet their needs, he said, adding that the Jordanian citizen and foreign workers in the Kingdom must be treated with respect and provided with proper services. The prime minister praised the electronic linking between the Social Security Corporation and other institutions and ministries, which help in providing better services to citizens.